A Dutch utility is inviting five families to use radiator-sized servers to heat their living rooms for free. In a trial organized by local utility Eneco, Nerdalize will install its server radiators in five homes, using them to deliver cloud computing services to its clients. The households using the heater could save €400 (about US$440) on their annual heating bill, said Eneco spokesman Marcel van Dun . Nerdalize pays for the electricity, but doesn't have to deal with the space and cooling costs of conventional cloud and co-location data centers, allowing it to sell its services for 30 to 55 percent less than more conventional cloud-providers, it said. Because the same energy is used for computation and heating, there are also environmental benefits, according to Eneco and Nerdalize. A radiator server running at full capacity would use over 8,000 kWh each year, Van Dun said, but Eneco expects actual consumption to be less. Nerdalize CEO Boaz Leupe said the servers will perform complex calculations for companies and research institutes, including Leiden University Medical Centre. The radiators heat water in a closed system to between 45 and 55 Celsius. A knob on the side of the radiator controls the heat fed into the room, while excess heat can be dumped by circulating the water through a heat expeller outside the house, Leupe said. For now this means making a hole in the external wall on which the radiator is mounted, but in future the company might use longer pipes to carry excess heat elsewhere.. When there is no demand for computation but someone wants heat, Nerdalize will donate computing power to other causes such as research into amyotrophic lateral sclerosis (ALS), Leupe said. If the Internet connection fails, the servers will revert to solving "dumb calculations" so people will still be able to keep warm, he added. 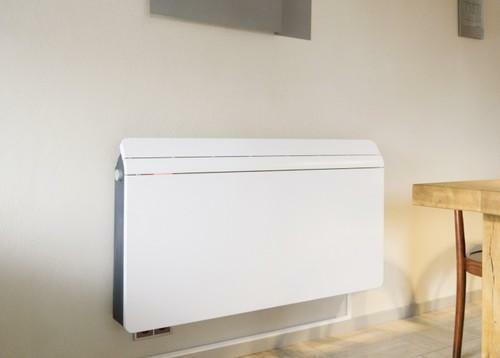 Households wanting to participate in the trial will need to be Eneco customers with an external wall they can pierce to mount the radiator, and a fast Internet connection. The field test will take at least until the end of the year, after which Eneco will decide whether to make the system available to more households. Nerdalize and Eneco certainly aren't the only companies distributing their cloud computing servers in this way. In France, for instance, a start-up called ViFiB wants to save on expensive data center space by placing its servers in homes and offices, and in Germany a company called Cloud&Heat offers similar services. Meanwhile, the University of Leeds in the U.K. has been using servers to warm the radiators in one of its laboratories.